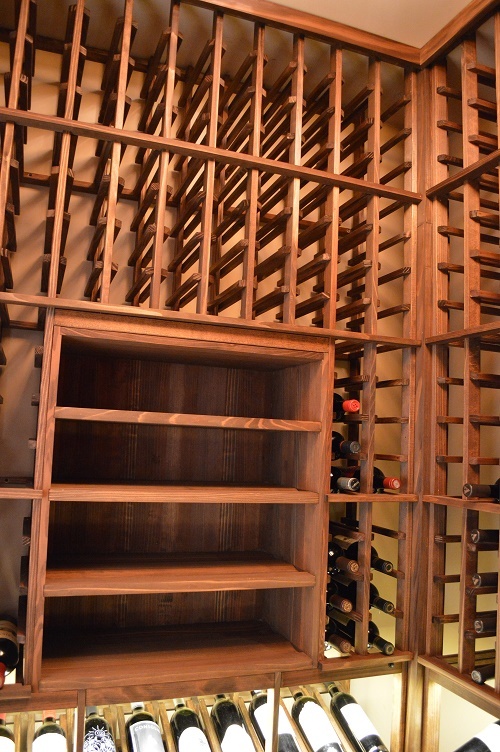 It’s not impossible to transform an area in your home into a unique storage space for your wines. 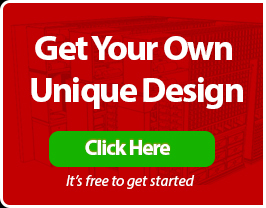 Working with a reliable builder in Vancouver will ensure that your custom wine cellar will store and display your collection according to your specific requirements. 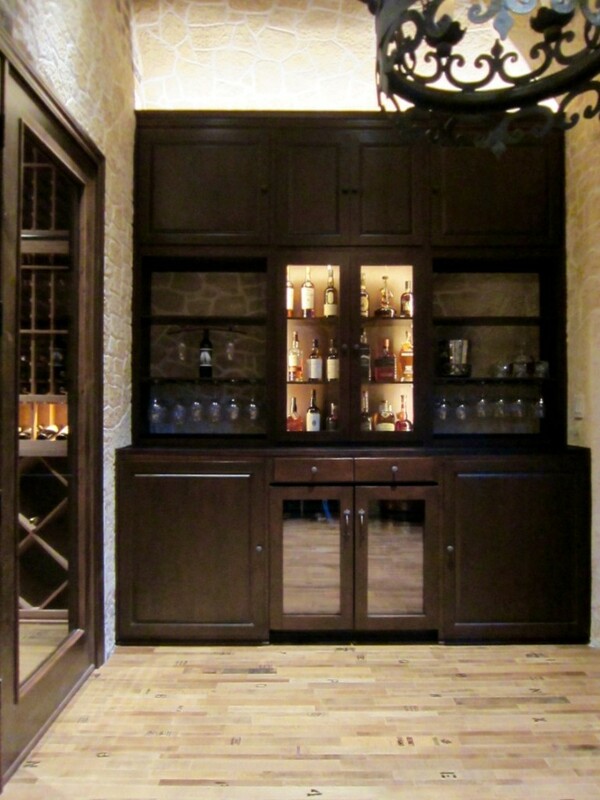 Check out how Blue Grouse Wine Cellars built an eye-catching wine room in a basement. If you are collecting wines, the first thing that you must consider is providing them with a safe storage space where they can age gracefully. A stable environment will help wine preserve its complex taste and aroma, allowing it to reach its peak maturation before it is consumed. 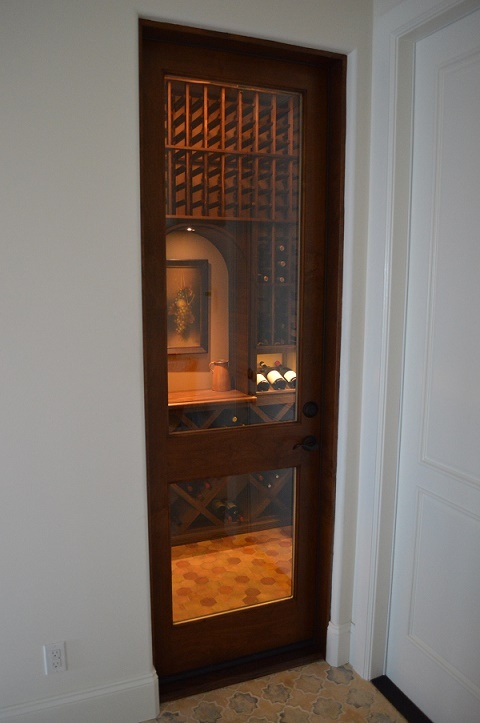 This will let you enjoy every bottle of your favorite vintage. 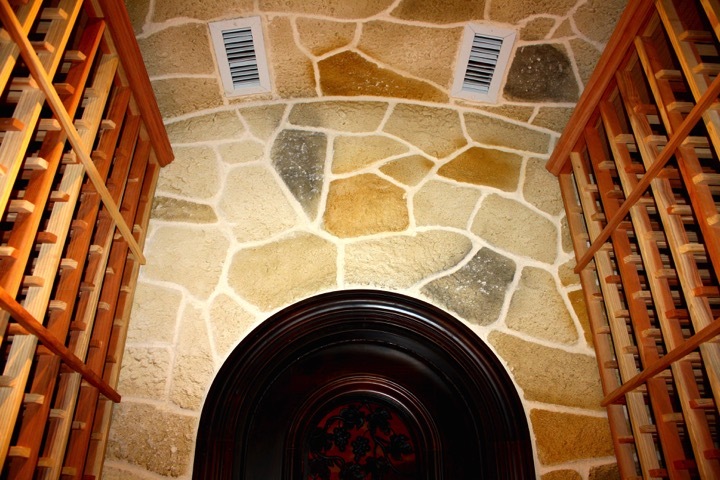 For many homeowners, the aesthetic appeal of their wine cellar also matters. They want their collections to be displayed dramatically, according to their personal preference. 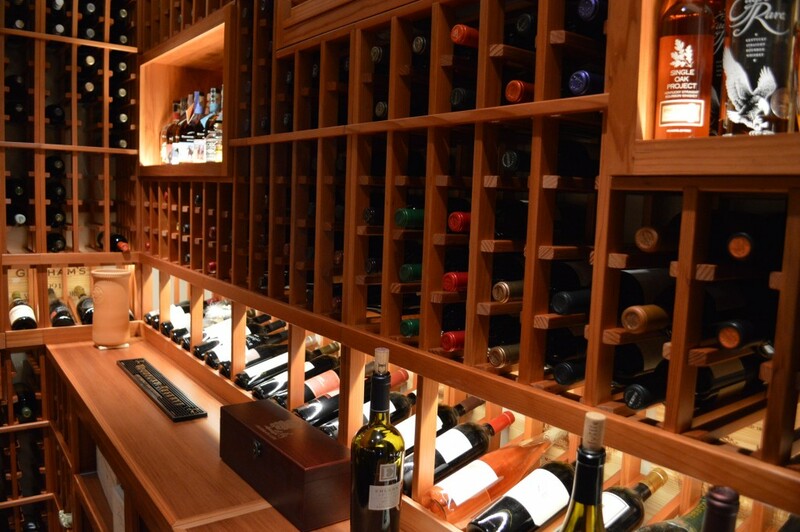 A safe storage space and beautiful wine display are the reasons why many residential owners invest in a climate-controlled custom wine cellar. In addition, if you have a growing collection, converting a space in your home can be the best solution. 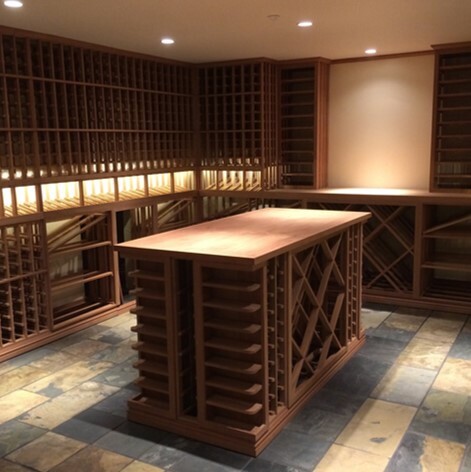 Blue Grouse Wine Cellars, one of our partners in building custom wine cellars, recently completed an installation project in Vancouver. 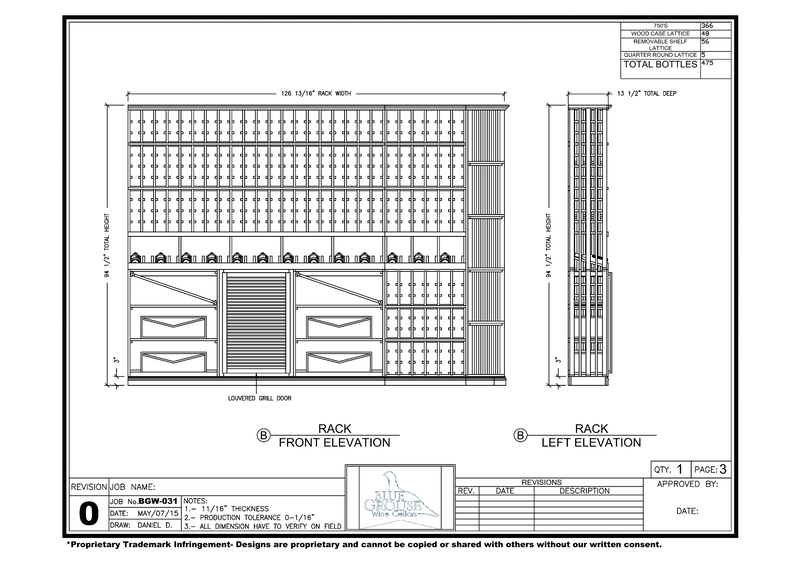 After a careful assessment of the client’s needs, Blue Grouse Wine Cellars created custom 3-dimensional drawings that showed the dimensions of the room, different elevations, and plan views. They made sure that the room can achieve optimum conditions by sealing it and installing an efficient wine cooling system. 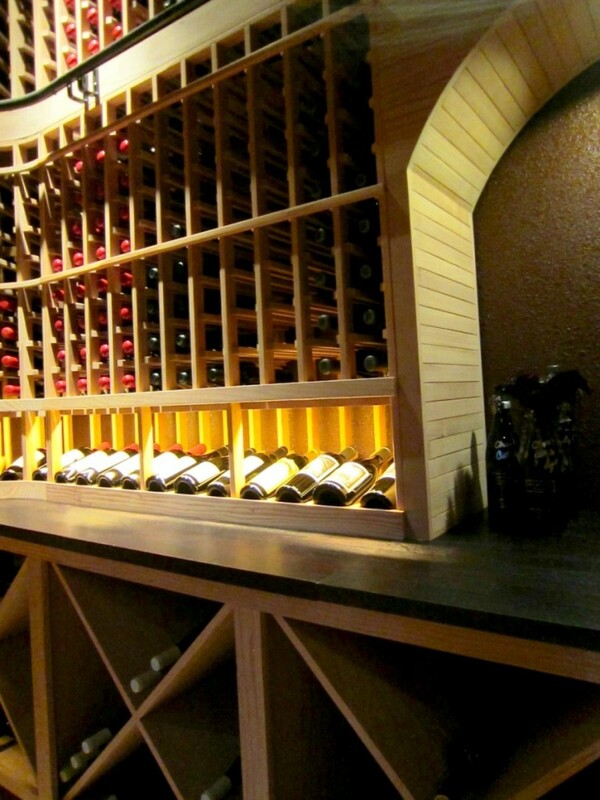 They installed beautiful, high quality wine racks made from wood and metal. 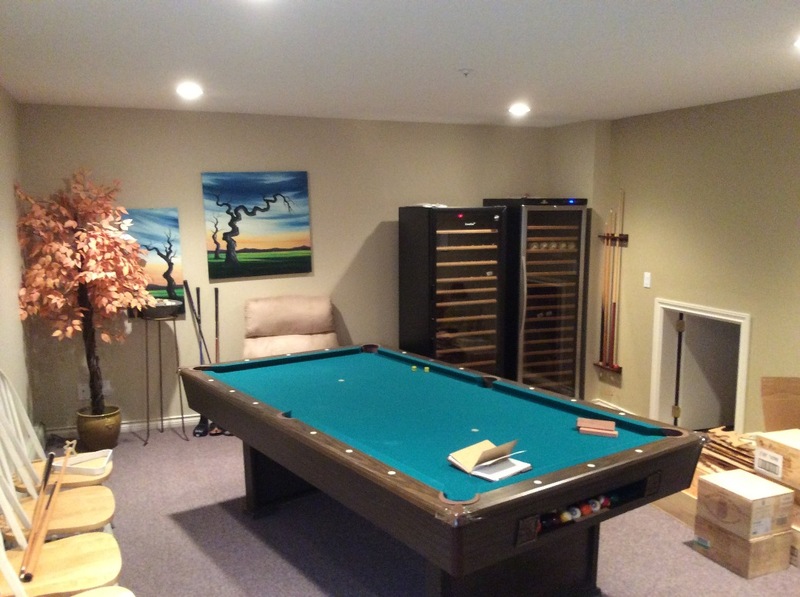 The basement had a couple of wine cabinets and a heavy pool table in it, which were transferred to a room upstairs before the construction began. One of the challenges in this Vancouver home wine cellar project was the window to the outdoors. Light must be prevented from coming through the window because it can damage wine. To achieve this, Blue Grouse Wine Cellars built a wall in front of it. After the client’s approval, they started the construction by installing the proper insulation. 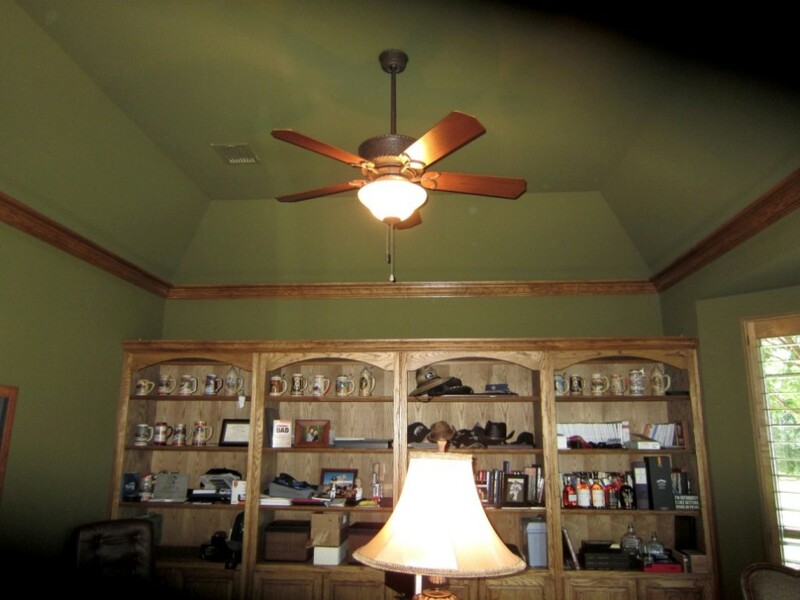 Insulating the walls and ceiling will prevent the warm air from entering and the cool air from escaping the room. The absence of proper insulation will negatively affect the quality of the wine. 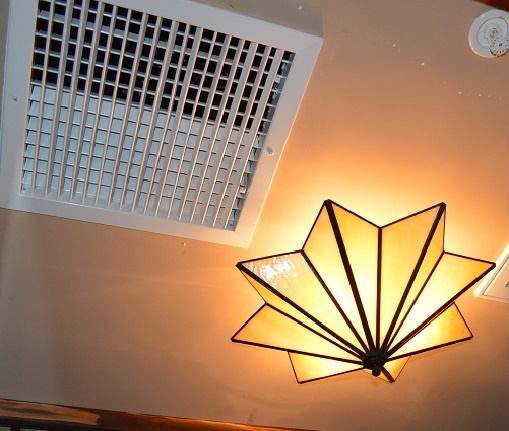 Additionally, this can also result in the breakdown of your cooling unit and higher energy bills, because it will work harder due to the warm air that interferes with the cooling process. Blue Grouse Wine Cellars needed to take down the drywall on the walls and ceiling because the original room was not built to be a wine cellar. After installing the insulation, they put up the new type of drywall, which was intended for a refrigeration wine storage area. They also used the same process of insulating and dry walling the room that can be accessed through a small door. This space is located under the stairs, and Blue Grouse made it a “secret” wine storage space to provide additional bottle capacity. 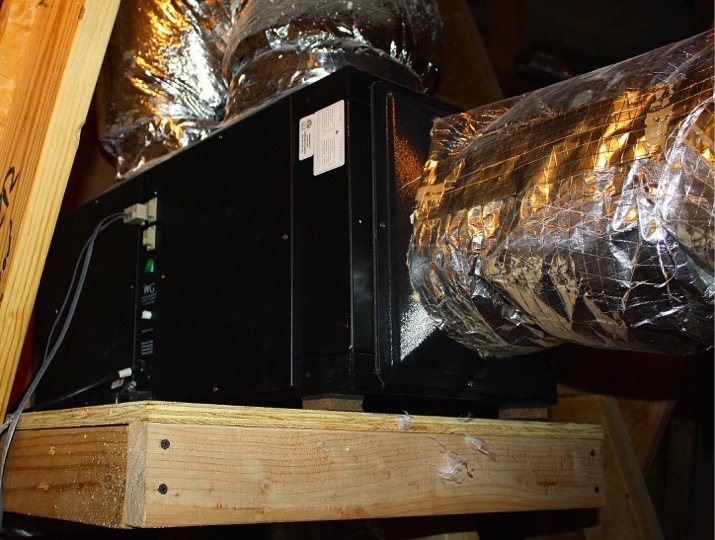 In addition to insulation, they also installed a reliable refrigeration unit. 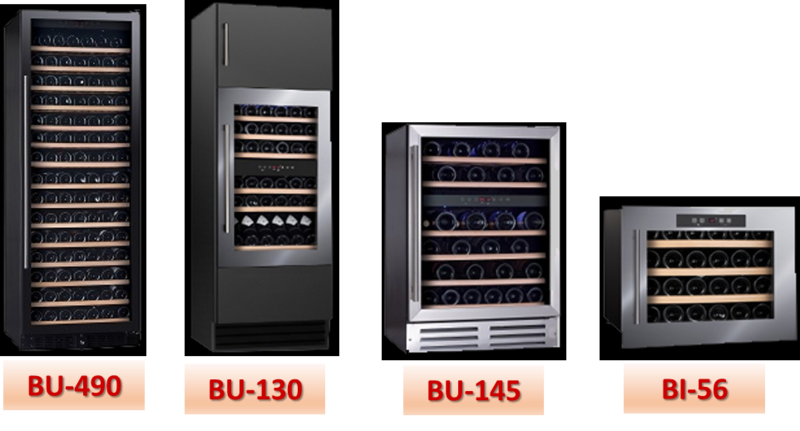 The ONAM CW30-W water-cooled cooling system was the ideal choice for the wine cellar. 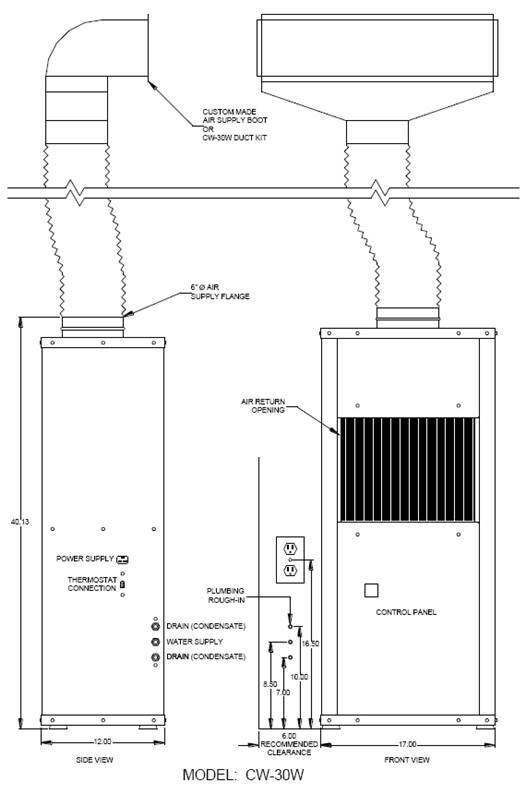 This self-contained unit did not require an HVAC professional to do the installation. Blue Grouse Wine Cellars aims to create a wine rack system that will display their client’s collection beautifully and safely. 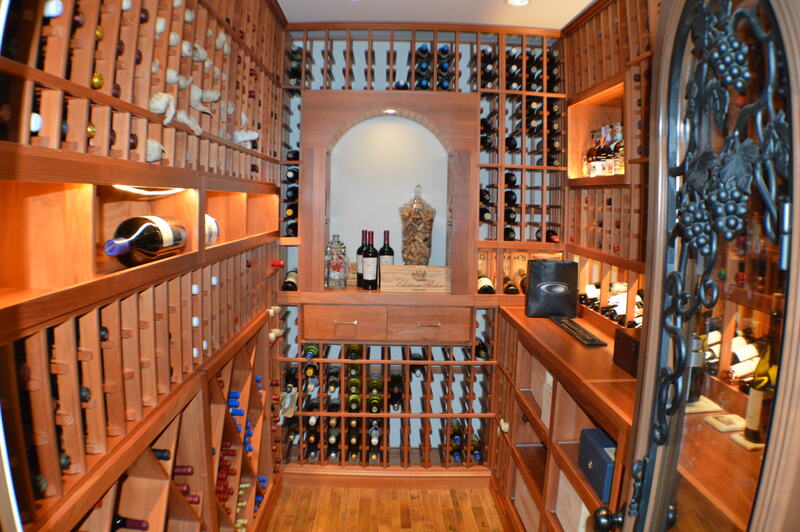 In this project, the owner is a high-end wine collector who wanted a traditional yet contemporary home wine cellar. 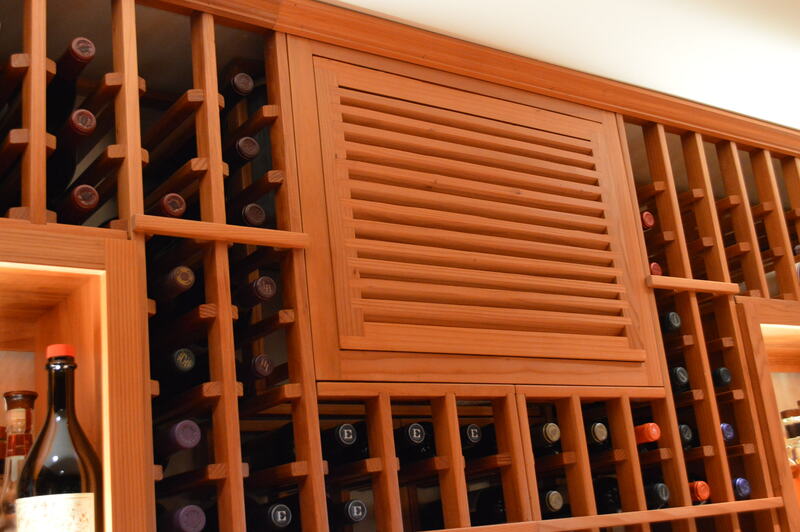 With their extensive experience, passion, and creativity, Blue Grouse Wine Cellars was able to create a stylish wine storage space using wood and metal to satisfy their client’s needs. 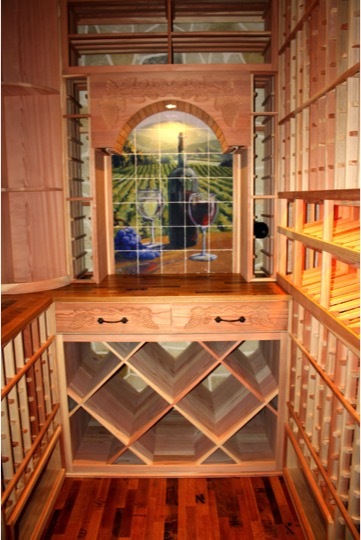 Wine collectors who want a traditional wine room should opt for wooden storage racks. 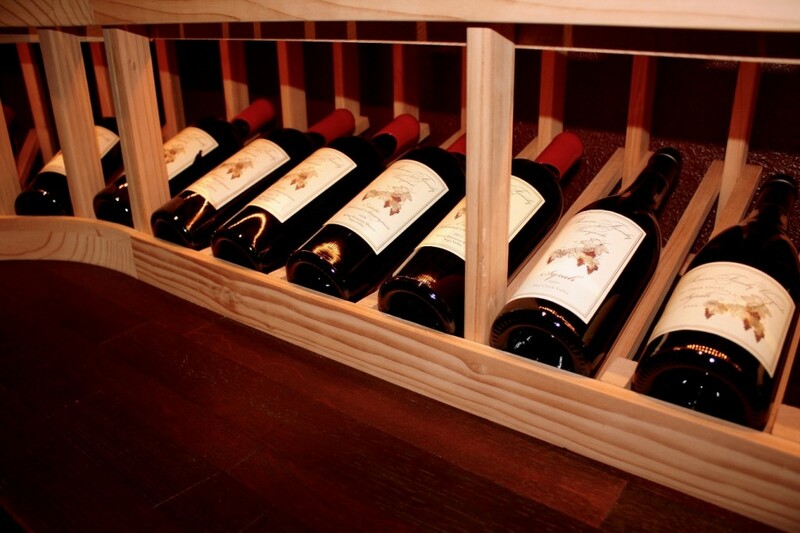 At Blue Grouse Wine Cellars, they offer various types of wood to cater to the specific needs of their customers. In this project, they used Sapele, a hardwood species that belongs to the Mahogany family. It is widely used by many builders to add drama to a living space because of its attractive grain patterns and natural luster. 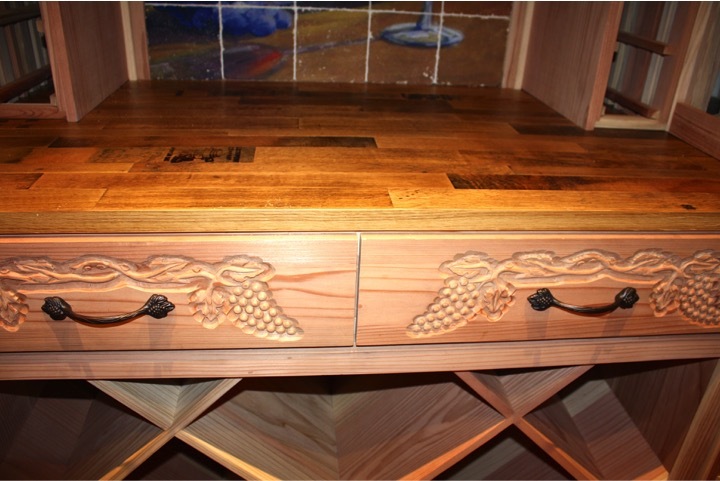 It is harder than other wood varieties because of its interlocking grain pattern. 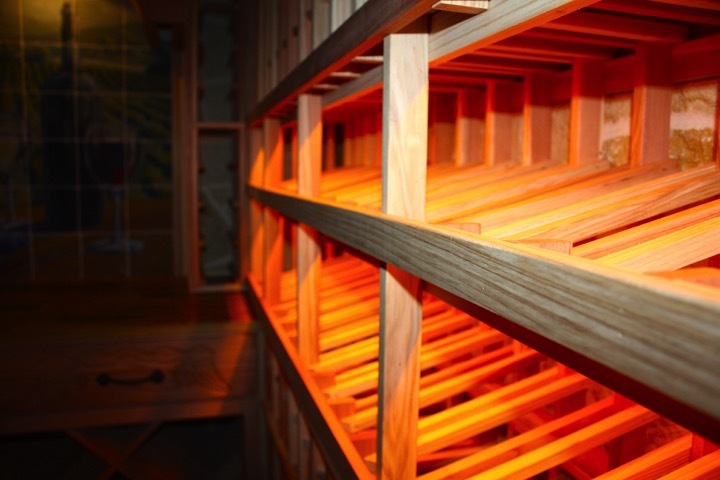 Other properties of Sapele Mahogany that make it an ideal material for wine cellar racks include the ability to withstand humid conditions. It also has a high resistance to rot and has superior stability. 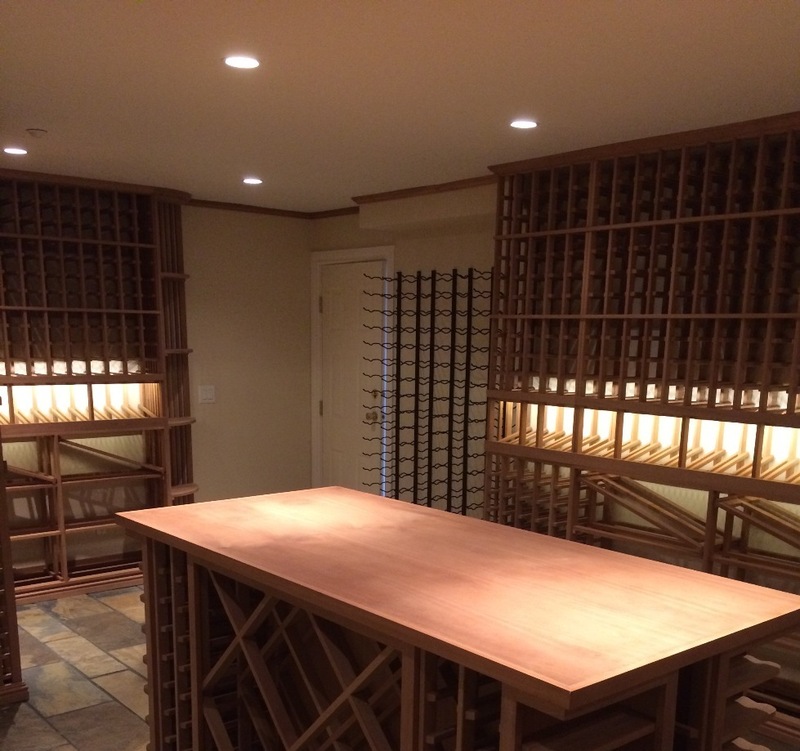 The wooden wine racks were not lacquered or stained because the owner wanted a scent-free Vancouver custom wine cellar. 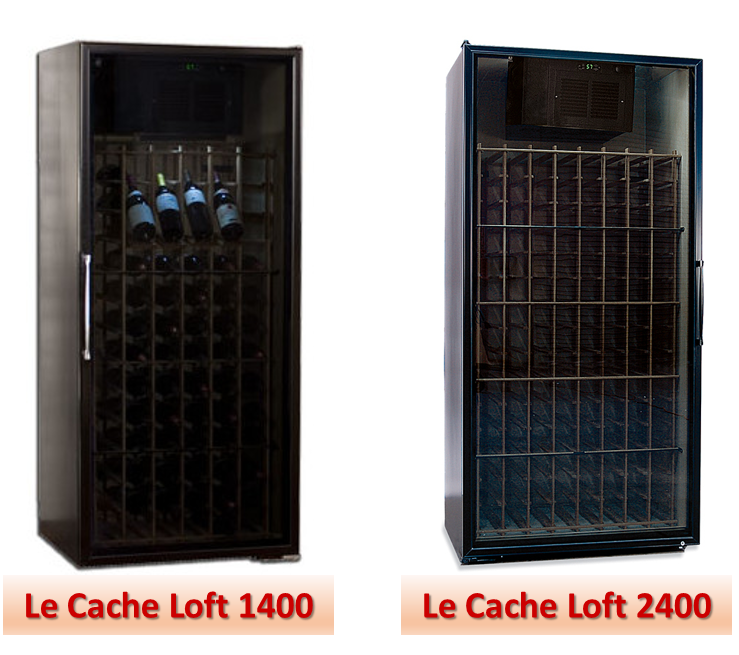 Blue Grouse Wine Cellars has extensive experience in providing innovative storage solutions to wine enthusiasts. In this project, they incorporated different bottle orientations to store the client’s collection in a unique way and provide added functionality. The first racking that greets you as you enter the wine room from the basement hallway is labeled Elevation B. 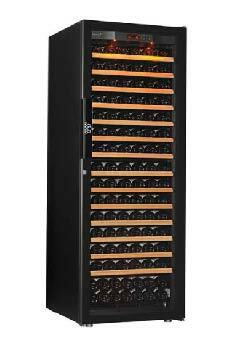 It starts with a 5-level quarter round display rack, which allows for bottles to be displayed vertically. 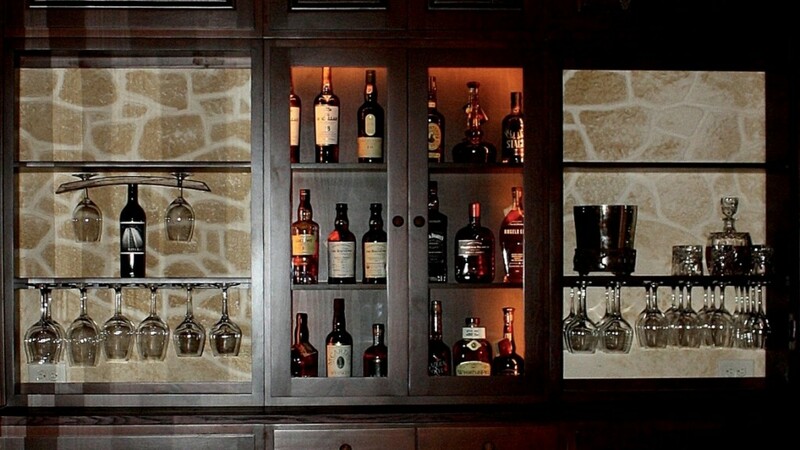 It also provides a space for storing wine glasses, decanters, and other accessories. 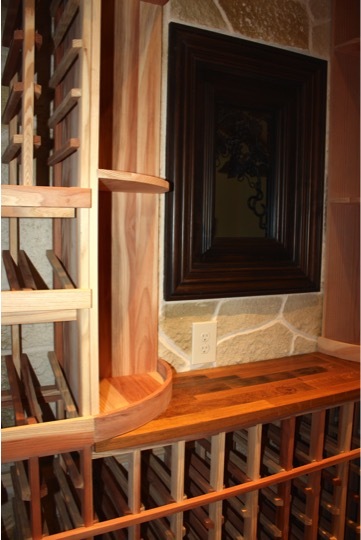 The next wine rack is intended for single bottle storage at the top section and a display row in the middle. This row stores the bottle at a 15-degree angle to prevent the cork from drying out. The cork will become brittle if it dries out. When this happens, an unwanted amount of oxygen can get in the bottle and cause the wine to be oxidized. Oxidation will spoil the wine and causes a waste of investment. At the bottom section is where the hidden storage area is located. 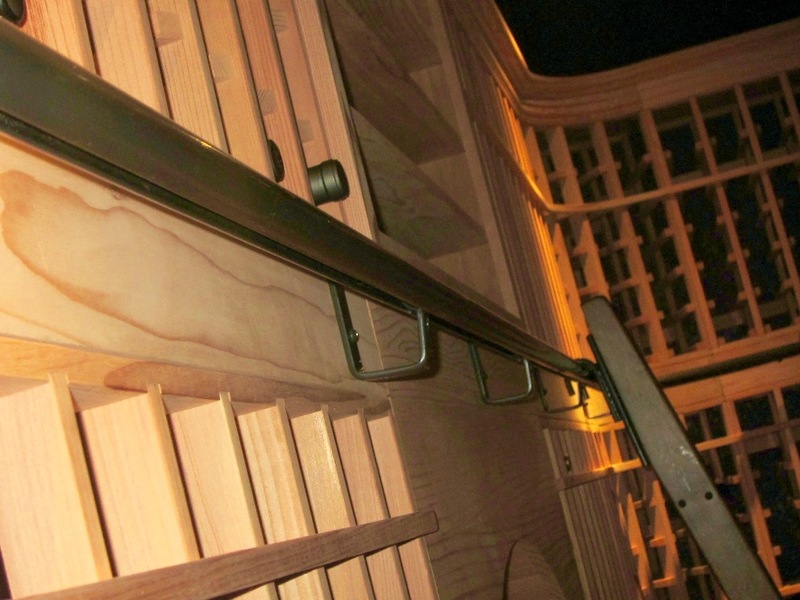 Blue Grouse Wine Cellars covered it with a removable wooden louvered grill to make it look like part of the racking. A wine refrigeration unit and proper insulation were installed to ensure that optimum storage conditions are achieved. 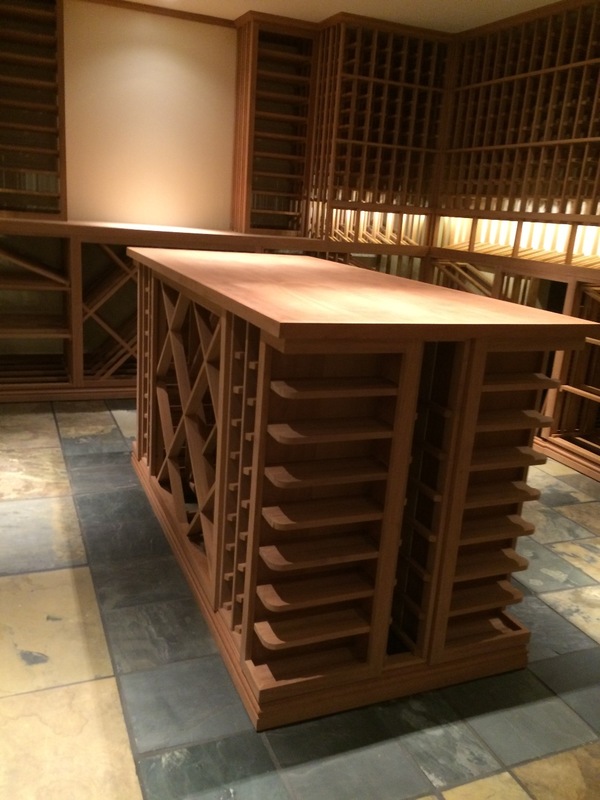 There are wooden case lattice racks and half lattice diamond bins on both sides of the secret wine room. To provide the client a convenient area for decanting and serving wine, Blue Grouse Wine Cellars created an open area with a wide tabletop at the center. Individual bottle and label forward display racks were installed on both sides of the open area. The center of the bottom section consists of lattice diamond bins, half diamond bins, and case storage racks on both sides. The next wall is Elevation E, which consists of the same bottle orientations as Elevation B. The only different is that it has no quarter round display rack. When you enter the door from the outdoors, you will see Elevation D, located on the right wall. Half lattice and wood case storage can be found at the bottom and a display row at the middle section. More individual bottle openings were added at the top section of the racking. The next wall is Elevation C, which faces the door. 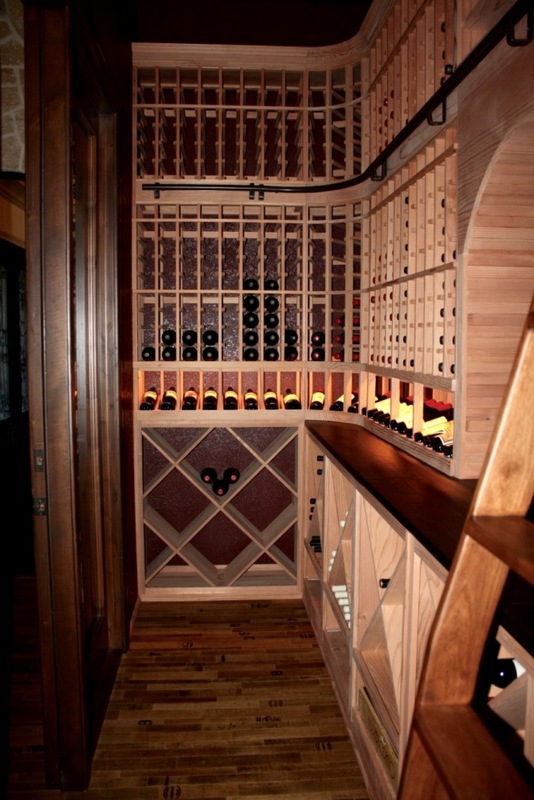 The wine rack, which is 54 1/4 inched deep, hides the wine cooling unit in a custom cabinet at the bottom. It also provides a horizontal display area for six large format bottles. 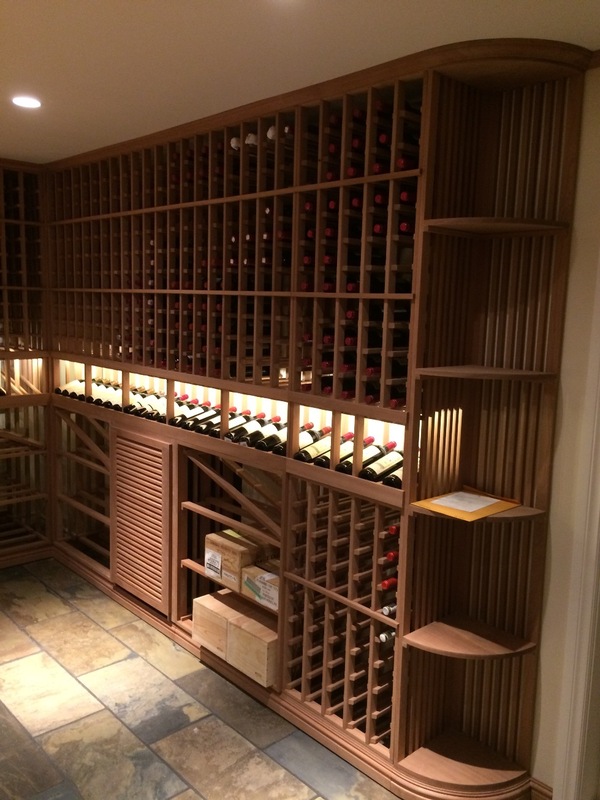 Incorporating metal racking satisfied the desire of the client to have a traditional and modern wine cellar. 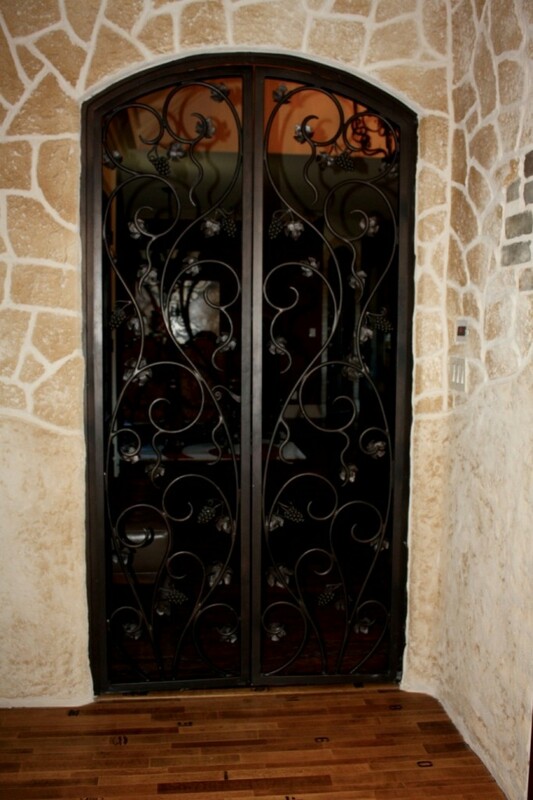 A 3-column single-deep metal wine rack from VintageView was installed on the left wall when you enter from the hallway. 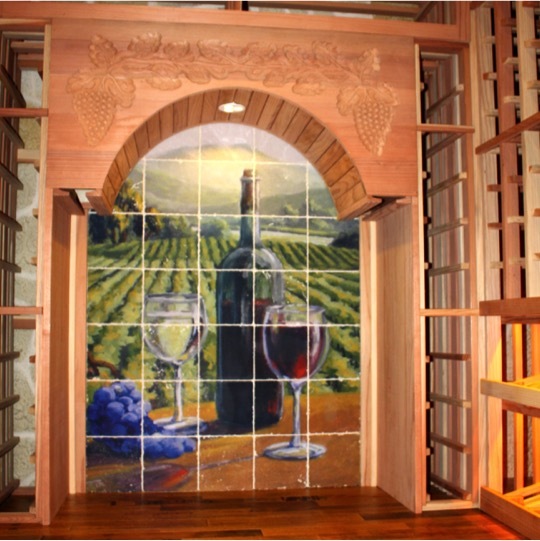 A 4-column triple-deep VintageView wine rack is on the left wall when you enter the wine room through the door from the outside. 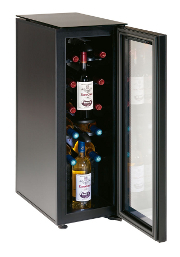 The sleek metal wine storage units were finished in Satin Black. 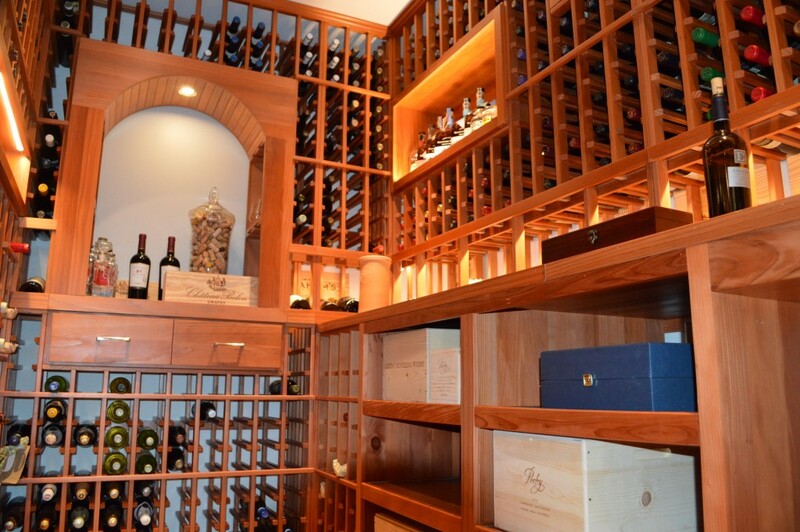 If you want an extra space in your home to be transformed into an elegant and safe custom wine cellar, contact Blue Grouse Wine Cellars Vancouver at 1.888.400.CORK (2675).